Early Start French 1: Salut! Ça va? If you first have to persuade your colleagues and the school authorities that it's a good idea to teach French to your class, our page Why PMFL? sets out some reasons that you and they may find persuasive. 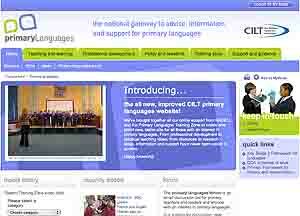 CILT (Centre for Information about Language Teaching) has produces on-line video clips which give an excellent presentation of the sort of work and standards of results that are possible. The French Embassy has linformation that will help you make a case for choosing to teach French as your language. One of the key areas of concern is pronunciation. The Early Start course has been carefully designed to give your pupils a firm foundation in language learning by helping them achieve an authentic pronunciation of what they know. Part of the approach is being able to "read off the page" how a French word should be pronounced. The professionals use "IPA" - the International Phonetic Alphabet. Read more about it HERE. If you did study French, but need to improve, most areas offer a local adult education course which may prove useful. The course consists of a set of 6 audio CDs. You will hear two primary teachers, Andrew and Sophie, working with a pair of expert tutors. The tutors help Andrew and Sophie to develop their vocabulary, grammatical understanding, pronunciation, fluency and confidence. These have been published for consultation, and the consultation period ended in December 1999. Visit the Modern Languages website for more information. The non-compulsory schemes have been updated to support those primary, middle and special schools that are currently teaching, or planning to teach, a modern foreign language at key stage 2. The scheme provides a flexible framework designed to help schools to develop or adapt their own schemes for a 4-year course. It comprises an overview and 24 units for French, and overviews (and similar units for Spanish and German). DOWNLOAD the European Language Portfolio from the Resources section of the Primary Languages website. There are detailed instructions on the web page of how to save and download the documents.